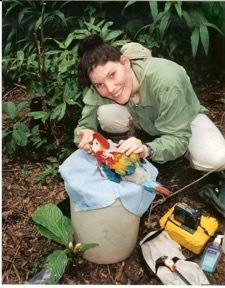 Debbie Goodrich has had extensive experiences with parrots for over 11 years. She first started her interest in professional training when she attended the University of California at Santa Cruz. There, she got her Bachelor's degree in Psychobiology--emphasizing Animal Cognition and Behavior. During her work at the University, she was specially selected to observe elephant seal behavior. She also wrote an extensive essay on Dolphin Reintroductions which received honors as her graduation requirement. Her professional work began with Rainforest Cafe where she was quickly promoted to a Curatorial position in Seattle. There, she established relationships with AZA accredited facilities such as Point Defiance Zoo and Aquarium, Seattle Aquarium and Woodland Park Zoo. She is a professional member of IAATE(International Avian Animal Trainers and Educators), an associate member of IMATA(International Marine Animal Trainers Association) and has donated to such causes as the World Parrot Trust and the World Wildlife Fund. 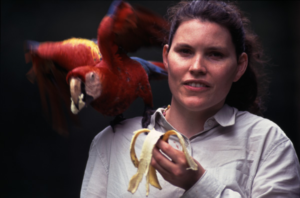 She has done work in tandem with Dr. Donald Brightsmith in literary research to assist in writing papers documenting parrots. Debbie has even gone to visit the parrots of Peru and the Tambopta Research Project to observe their wild behaviors which she now uses to help aide people in advice for their own birds in the home.